Canadian advertisers are moving more and more money onto the web, with spending continuing to grow by double digits, although the rate of growth is expected to slow this year. Alas, newspapers, while seeing healhy growth in their online revenue, are lagging behind. The IAB data shows that online video ads are still virtually non-existent, accounting for $9 million, or less than 1 per cent of the total online ad spend. Email advertising, an often over-looked category, appears to be declining, dropping from $20 million to $9 million year over year. According to this Canadian Newspaper Association report (.pdf), newspapers snagged $196 million of that $1.2B spending which was about $44 million more than they'd earned the year before. But the numbers also show that Canadian newspapers are failing to keep their share of that growth — while their online ad revenue grew by 29 per cent, that fell seriously behind the overall growth rate of 38 per cent. As a percentage of total revenue, online is growing, adding up to 7.6 percent of newspaper's total revenue in 2007, as opposed to 5.8 percent the previous year. Thank you for once again inviting me to address the World Association of Newspapers. I spoke to you at the 2003 meeting in Dublin. My speech was followed by a presentation by Hollinger’s Conrad Black, who gave us all a lecture on arrogance, of all things. Unfortunately, Conrad couldn’t be with us today, but I wish him all the best in his new home in Florida. Some newspapers in the U.S. won’t make it through this transition. Others will print smaller newspapers on fewer days. By my estimate, as many as 19 of the top 50 metro newspapers in America are losing money today, and that number will continue to grow. The large metros are the hardest hit by change, and they’re the most difficult to change. Too many whining editors, reporters and newspaper unions continue to bark at the dark, thinking their barks will make the night go away. They fondly remember the past as if it will suddenly re-appear and the staffing in newsrooms will suddenly begin to grow again. Well, as a former journalist, I also wish for the past, but it’s not coming back. The printed space allocated to news and newsroom staffing levels will continue to decline, so it’s time to get over it and move to a print model that matches the reality of a changing business. At a time when print circulation is declining by 2% - 4% per year, when ad revenue is shrinking even more drastically, when 2,400 journalists were laid off,when online revenue and readership is only re-capturing a fraction of what's bleeding away, a few boots to the backside are probably in order if anyone is still standing still long enough to get hit by them. Retaining an outside consultant to design, from scratch, a news organization infrastructure that meets today's challenges, as opposed to tinkering with systemsz that evolved to serve print alone. Creating regional "marketplaces", hub sites, that include news sites, user-generated, customer feedback and user-generated ads. In the next five years, move their revenue mix from: traditional print 89%, online 7%, new (niche) products 4% to 68% core, 20% online, 12% niche. The whole speech is well worth reading. But be sure and read the comments — aside from revealing some real bitterness and anger over what's happening within his chain, there's some thoughtful material. (Thanks to Eric McGuinness for pointing this one out to me. First employment classifieds. Then automotive advertising moved massively online. And now a (the executive summary) of new report out of the US by Borrell Associates suggests real estate advertising dollars are going to jump to the web in a big way. For newspapers the situation is worse. We project that coming off last year's high of almost $5.2 billion in print advertising, there will be a 6.8 percent decline this year (2007), almost the same again in 2008, followed by a stunning 16 percent fall in 2009 and 13 percent in 2010. 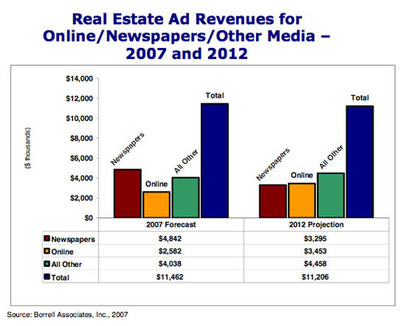 By then, real estate marketers will be spending more on online media than on newspapers or local homes magazines. The report says that overall spending on real estate advertising dropped by 3 percent in 2007, but that online spending on real estate increased by over 25 percent during that same time period. These numbers are all US figures and 2007 has been a spectacularly bad year for the US real estate market (the sub-prime mortgage market meltdown and a resultant recession). But regardless, the fact that within that context online ad spending by real estate industry actually increased by 25 percent is a very strong indicator of where those dollars are headed. We have many options for grabbing a good piece of those dollars (great relationships with the people spending the money, high profile in our communities) but we're abysmally slow at seeing and seizing those opportunities in both the resale and the new homes markets. Could we seek partnerships with the MLS? Build our own interactive maps, like Housingmaps.com's , to display rental, resale, open houses etc? Here's an embedded slide show of a presentation I created using Google's free Documents tools. The tools is very fast and easy, if somewhat less than sophisticated in terms of transitions etc. It has some interesting functionality - it allows people to join an online conversation about the presentation in real time in a sidebar, a kind of open back channel. Not sure if I'd use that in a classroom situation, but it might be interesting in a distance learning environment. Oh, and did I mention it was free? This presentation was on the difference between print and online advertising. In addition to the online collaboration, the tool offers an embeddable, simple flash-based slide show player, which I'm using here. Is free the future of our business? 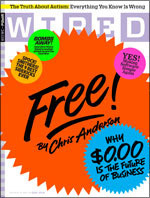 Another thought-provoking piece (soon to be a book) by Wired editor Chris Anderson examines the future of free, as a defining element of a digital economy. The shift from an economy based on scarcity to one based on abundance is already having profound effects on businesses touched by the digital demons — the music industry is one wildly obvious example, but so too is the news business. Information doesn't just want to be free, it busted out of the joint a long time ago and we have all been very slow to understand what that means and how to take advantage of it. Not everybody, viz the Metro papers. But imagine if 10 years ago you marched into your publisher's office and said: "I've got great idea! Let's make a cheap, crappy tabloid paper, cram it full of truncated wire copy, and then each day we'll give away 300,000 copies!" But I still am left with more questions than answers (Why or why didn't I take economics in University?) For instance: When the unit costs of manufacturing and distributing a product approach zero (as they now do in the news business) but there is still a high demand for the product, how do you get the REAL costs paid? (Our traditional answer, and one Anderson points to, is to bring a third party (advertiser) into the transaction - and they pay the costs. In that case the transaction is us selling the readers attention to the advertiser. In an article written for Harvard's Nieman Reports special issue on Local News, Richard Anderson, founder of the award-winning Village Soup web sites argues that most newspapers get it all wrong when they go on the web because they think of the site as a performance, a stage show, while his "community host" model combines that "show" with something like a trade show floor where everyone can gather to share ideas, browse and buy. The conventional community newspaper approach to going online is analogous to an event production; just as a star performs on stage, reporters “perform” by providing compelling narrative and factual reporting for an audience of readers. Similarly, just as advertisers are eager to display their names around the concert venue, newspaper Web site advertisers use banners and buttons to compete for the attention of the gathered readers. In contrast, our community host model is more akin to a trade show. Attendees learn from keynote addresses and sessions, then share ideas, knowledge and views during breaks, luncheons and receptions, and shop with exhibitors, who answer their questions about latest offerings and features. The community host model assumes active seekers who are looking to learn from our reporters, to share with their neighbors, and to shop with their community business operators, professionals and trades people. His company began their local news sites on the web, and later began producing print products (i.e. newspapers) to meet their communities needs (and crush their competition). Anderson has something like 13 employees producing professional stories and photos and ads - the rest of his content is the community talking to itself. His print products are now #2 and #3 in a six paper market - where all the other papers have been around for over 100 years. He says that users of Village Soup use it a lot —75 per cent of their users visit at least 10 times a month; 32 per cent of their users visit at least 200 times a month or nearly 7 times a day. Village Soup won one of last year's Knight Foundation News Challenge awards and will be producing an open source template for others to adopt in their own communities. I want me one of those. His sites are worth visiting, and his philosophy well worth studying. Visit Village Soup here, read Anderson's report here. 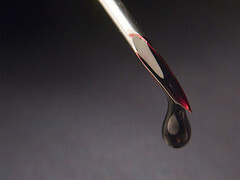 Death of the Subscription model? Is the news that even the Wall St. Journal will be dropping its walled garden approach to its news in the hopes of generating more revenue via advertising the final death knell to the paid subscription model for newspapers online? Don't tell The Globe and Mail that. Their confusing array of subscription models seems specifically designed to frustrate and trip up readers. But for most of the English-speaking newspaper world, the walls have tumbled, or are crumbling rapidly. "Part of my job as publisher is to create the very best possible experience for people so they can advance into a deeper relationship with us," Edwards said. "Eventually, they can transfer over to be a print subscriber." Transfer over to be a print subscriber? Hello? Did cheaper cars encourage people to switch back to horses? Stoltz entitled his post "Unpaid Content and Delusions of a Print Renaissance" and I think that about sums it up. The unanswered question, however, is this: what about local news? Does the wide and deep availability of massive amounts of non-local web news, information and entertainment mean that readers won't pay for local news? "Subscriptions thrive in an area where there's scarcity -- content that people can't get anywhere else," said Rafat Ali, publisher of PaidContent.org. "Other than that, you need an advertising-based model." If almost no one else is offering local news on the web, doesn't that make it scarce? Doesn't that suggest a future for the paid subscription model? Alas - for I really, really worry about the future of local journalism as newspapers the great money machine that funded it, dies its slow death. I think that blogs, social network sites, increasingly robust web communication from community institutions, etc mean that local newspapers don't have a lock on local news and are in real competition for people's attention. And that means that at the local level - like virtually everywhere else on the web, the audience is in control. Yeah, yeah, we all know newspaper classifieds are under direct attack from sites like Craigslist and Kijiji and even Facebook's Marketplace, but the reality is that classified ads are such a clear winner in the race to monetize the web (there, I said it, now I promise not to use the term for the rest of the year) that many, many people are trying to innovate in that space, trying to come up with the next ebay or .... well, Craigslist. The idea behind (the,I think horribly-named) Thembid is that consumers post the things they want on the site (for free) and businesses 'bid' to provide it for them. "Don't search-make them bid" is the site's motto. Going there today I see a fellow in California who wants wants someone to add another 2 feet of height to his 75 foot long wall. As I write he's received 5 'bids" on the job, ranging from $900 to $2000 from contractors. Thembid says they offer a rating service which will assist consumers in choosing who to work with based on the recommendations of other users. Although posting 'asks' and 'bids' is free, Thembid says they'll make money by upselling the businesses. Will it work? Maybe - if they can build a lively, local community. Is it a model local newspapers could learn from? Again, I think maybe. I'm just not sure how you make money off it. The other site is Jellyfish - a start-up that was just snapped up by Microsoft. Jellyfish is a shopping search engine with a difference - actually a host of differences. They offers users the whole social web experience - you get your own page, you can hook up with other shoppers, trade tips and recommendations etc. They hold reverse auctions,"Smack" shows, where a specific (and secret) number of items are sold at auction with the price dropping continuously. They work hard to make shopping online sociable and fun. But the the real difference about Jellyfish ("We Share!") is not the auctions or the gay graphics, but the unique pricing model - advertisers, whose products and services are listed in the Jellyfish shopping search engine only pay for their 'advertising' when they make a sale - and Jellyfish promises to SHARE THE COMMISSION with the buyer. Every item you search for in the search engine shows the prices - plus the cashback you'll get from Jellyfish. Microsoft obviously thinks so - but who knows? The point is, I think, how far beyond "selling space" web advertising is going.